But two years before, Dimitrov was flying high, literally, as he took a plane from the Soviet Union to the land of his birth. 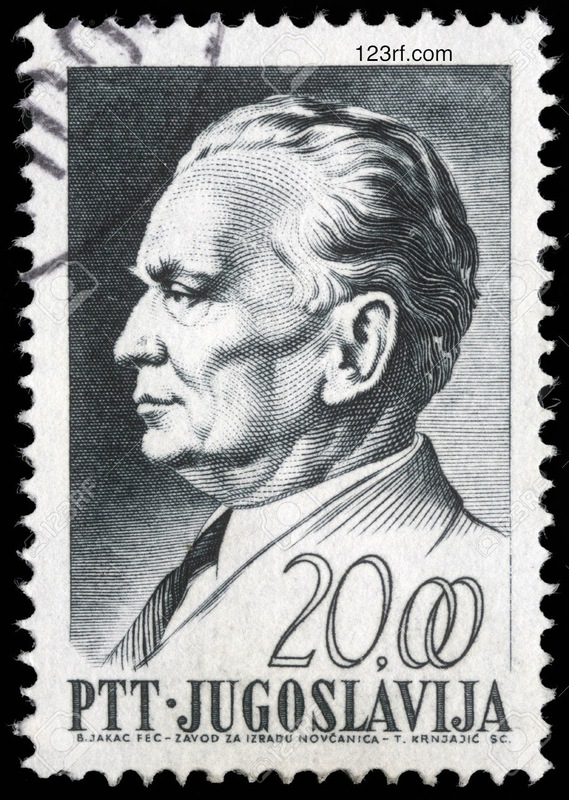 On November 4, 1945, Dimitrov wrote in his diary “Landed at Sofia airport…After twenty-two years I am again on Bulgarian soil.” By October 1946, ex-citizen Georgi Dimitrov became both head of Bulgaria’s Communist Party and Prime Minister, though he kept the Soviet citizenship granted him by Stalin just in case. 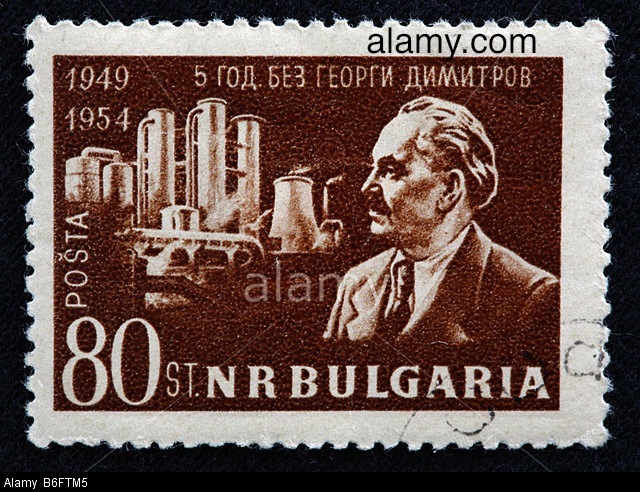 He followed Stalin and the Soviet example, wasting no time in increasing internal repression in Bulgaria through arrests, show trials, and detention in a system of forced labor camps, and executions. The town of Dimitrovgrad was founded in his honor; countless schools, clubs, and streets were named after him as was the Order of Georgi Dimitrov for service to country and to socialism. His July 1949 death at 67 after three months in the Barvikha Sanitorium just 18 miles west of Moscow still rankles conspiracy theorists. They suspect Stalin had a hand in pushing the deterioration of Dimitrov’s health to the point of no return. The Soviet Union announced diabetes as the cause of death. DC’s Evening Star newspaper reported “The highest councils in Russia, the Central Committee of the Soviet Communist Party and the ministers of the U.S.S.R. made the announcement of death. They said it caused them profound grief.” Ivo Banac, historian and Yale professor emeritus, edited Dimitrov’s 1933-1949 diaries and believes that while Dimitrov suffered for decades from naturally-occuring “diabetes, chronic gastritis, a diseased gall bladder, and a variety of other health ailments,” the actual cause of his death was the unnatural Josef Vissarionovich Stalin who is not known to have ever grieved the death of anyone. Georgi Dimitrov may have died in 1949, but he wasn’t buried until 1990. The Communist Party/Bulgarian Government immediately capitalized on Dimitrov’s death to mimic the Soviet Union’s successful preservation of Vladimir Lenin since his death a quarter century early. Whatever role Stalin played in Dimitrov’s demise, he was willing to share the secret Soviet mummification technique heretofore used only to preserve Lenin’s corpse. Seemingly moments after Dimitrov’s death was announced, the construction of his mausoleum in Sofia began. In the six days it took for Dimitrov’s body to return to Sofia from Barvikha, the Georgi Dimitrov Mausoleum was completed, made possible in part by a quick-setting cement from the Soviet Union. It’s said that it was designed to withstand a nuclear bomb. Dimitrov’s embalmed body was brought to his not quite final resting place in a funeral cortege fit for a king and in fact one of the lead architects of the Mausoleum, Georgi Ovcharov, was a good friend of Tzar Boris III and his family. Just over 40 years later, after the fall of the Berlin Wall and the resulting end of the People’s Republic of Bulgaria, the body was removed, cremated, and the remains buried in Sofia’s Central Cemetery. Then began the debate over the fate of the Mausoleum itself. The man, the body, and the cult were all gone, but what to do with the edifice that was its greatest physical manifestation? There was graffiti from the start, at first hesitatingly and then irrepressibly. There was creativity. In 1997, the director of the Sofia National Opera and Ballet presented Verdi’s Aida in front of the Mausoleum, incorporating it into the set. I’m told that when the live action film 101 Dalmations was released in Bulgaria, the Mausoleum was decorated with black spots as a promotion. To Disney belong the spoils. The Mausoleum debate was heated. The words “communist” and “fascist” were freely thrown around by all sides within the government and in the public at large, as were accusations of barbarism and vandalism. For good or for ill, imposed forcibly or no, the neo-Classical building had accrued great stature since its construction—despite the graffiti thickly accumulated since Dimitrov’s departure. The Mausoleum might have been converted to a museum or an art gallery to preserve the decades-long history of the building and its single denizen, or it might have been repurposed entirely. But the 1999 Union of Democratic Forces (UDF) government wished only to separate itself and the country from its all too recent past and, despite no public consensus, decided to take what UDF leaders insisted was the cathartic step of destroying it altogether. It took about as long to destroy the Mausoleum as to build it. On Saturday, August 21, 1999, a crowd gathered. A powerful non-nuclear blast from over 1300 pounds of explosives was heard. Windows in nearby government buildings shattered, but the Mausoleum itself seemed impervious. Later that day, another blast. The Mausoleum stood firm. Some in the growing crowd were entertained, some jeered and the politicians present were frustrated and embarrassed. The demolition experts and workers planned a third attempt for the next evening—adding 660 pounds of additional explosives—and this time the Mausoleum listed a bit to one side. Clearly there would be no one decisive, dramatic blast. For days, the demolition team mulled over the ideal combination of small detonations and brute mechanical labor by workers and bulldozers. On Friday, August 27, 1999, the Georgi Dimitrov Mausoleum was at last razed to the ground. Today the site has been incorporated into a large park that stretches from what was the front of the marble structure to the plaza facing the National Theater. 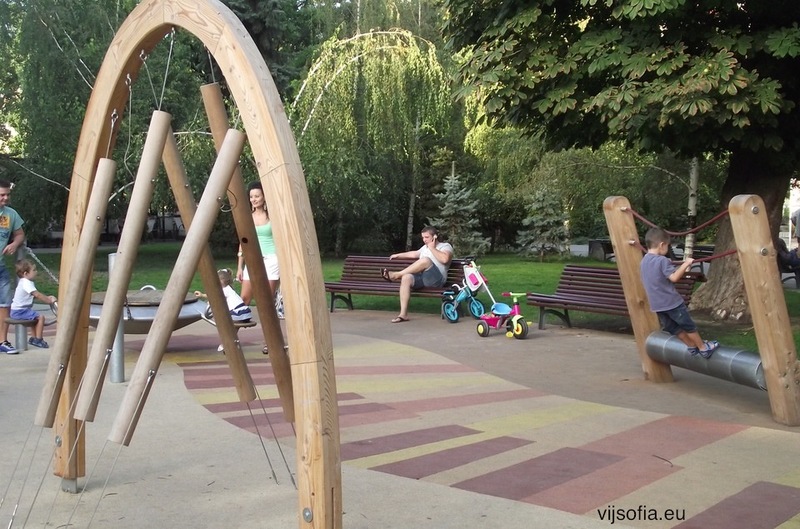 There is a new playground based on musical instruments, festivals held throughout the year, events and celebrations, and, throughout the spring and summer, an enormous moon bounce for children. You pay for 20 minutes and a very nice woman watches the children with an eagle eye to make sure no one misbehaves or tries any bouncing that appears overly risky. There is also an outdoor restaurant located precisely on the mausoleum site. Menus identify it as the Mausoleum Café. When we lived in Bulgaria 2010-2012, Rumen enjoyed getting a table with friends while the kids were in the moon bounce or ran around, occasionally making appearances to eat French fries sprinkled with grated sirene white cheese. 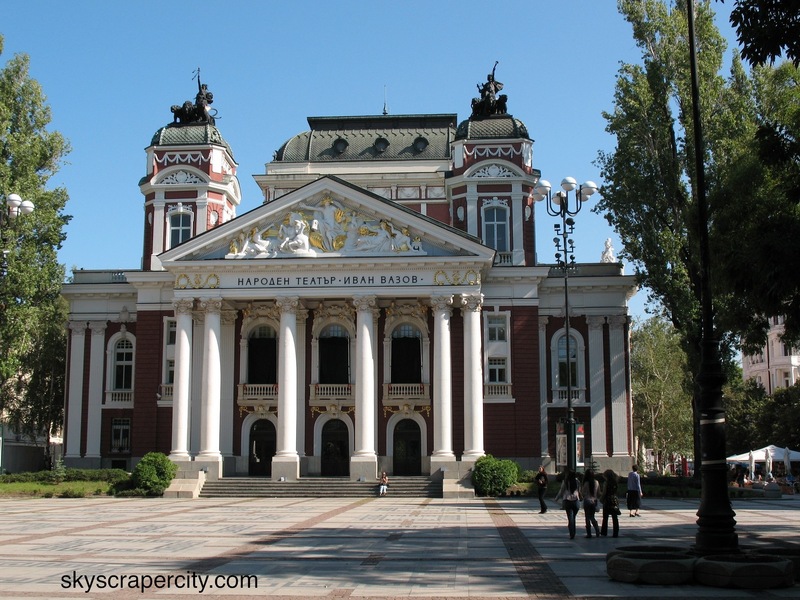 The stunningly beautiful neoclassic National Theater Ivan Vazov can be seen across the park and the National Gallery of Art housed in the former royal palace is just behind across the yellow brick road. “History is written by the victors,” said Winston Churchill, but for most Bulgarians Georgi Dimitrov has not been historically reassessed but erased entirely. The communists ruthlessly repressed the history that contradicted their narrative, but those that replaced them have not had to do much of anything to give life to an altogether new Bulgarian story. Dimitrov’s overwhelming presence and meaning have been entirely obliterated with something as utterly mundane as an outdoor café. 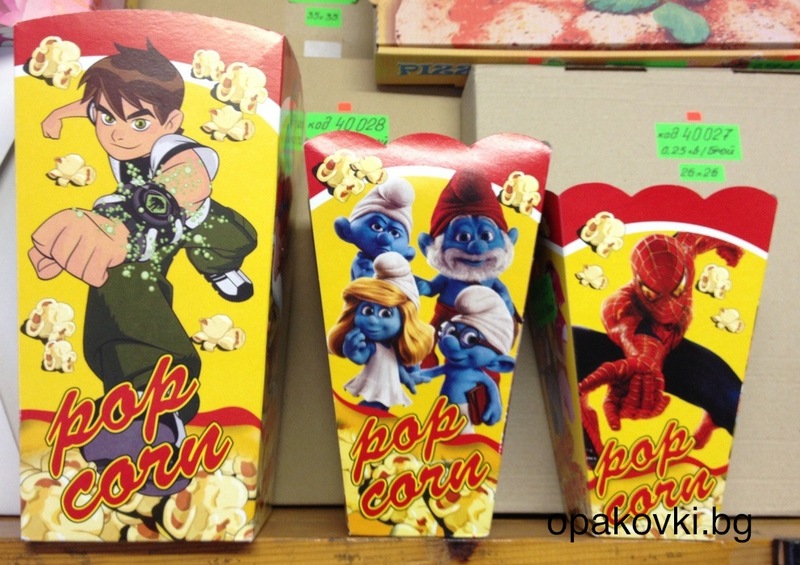 The Mausoleum’s honor guard with braided and tasseled uniforms, rifles stiffly held, has been replaced by popcorn spilled out of colorful cardboard boxes on which are printed “American popcorn” and images of children’s characters Ben10, Spiderman and the Smurfs.